Very little is known of Ermengarde de Beaumont who became Queen of Scotland in 1186 when she married the forty three year old King William I of Scotland, later known as “The Lyon”. She was plucked out of obscurity by King Henry II of England as the chosen bride for the Scottish King. Ermengarde was born in 1170, the exact date being unknown. Her father was Richard I, Viscount de Beaumont-le-Vicomte and her mother was Lucie de-l’Aigle. Her father was the son of Constance (or Maud FitzRoy), an illegitimate daughter of King Henry I of England. We know nothing of her early life in France and it was only when she was mentioned as a wife to the Scottish King that she comes to light. William became Earl of Northumberland when his father died in 1152 and he was nine years old. 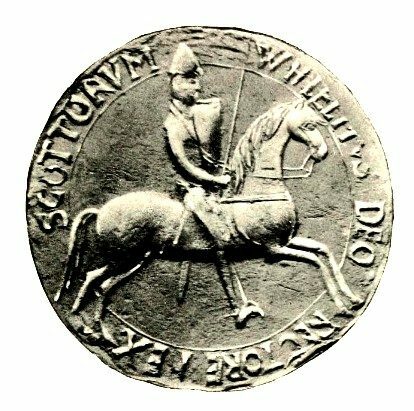 In 1157, his brother, King Malcolm IV of Scotland managed to give away William’s Earldom in his dealings with King Henry II of England, something that William was never able to forget. William succeeded his brother as king in 1165. When King Henry II of England’s sons rebelled against their father in 1173, William joined them. William was captured at the Battle of Alnwick and was taken in chains to Falaise in Normandy. While William was in captivity, King Henry invaded the north of England and took several Scottish castles, including Berwick and Edinburgh. William had no heir and was worried about the fate of the Scottish Kings. He was forced to negotiate with Henry II. The resulting Treaty of Falaise required William to swear to King Henry that Scotland would be subordinate to England. During the next fifteen years, Scotland was subject to English rule. Henry took his duties as overlord very seriously. So seriously he wanted to choose a bride for William. In 1186, William was forty-three and unmarried. William was asking to marry Henry’s granddaughter Matilda, daughter of Henry the Lion, Duke of Saxony. But Henry was not interested in allowing William such a prestigious bride. Instead he chose the daughter of a French nobleman, Ermengarde de Beaumont. Henry offered to pay for the entire wedding and returned to William two castles that he had forfeited during their struggles, one of them being Edinburgh. Henry also gave William land valued at 100 merks and 40 knight’s fees. The return of Edinburgh was probably the deciding factor for William, even though he considered the bride beneath him in status. Ermengarde’s parents brought her to England. William and Ermengarde were married in the royal chapel at Woodstock near Oxford in England on September 5, 1186. Baldwin, Archbishop of Canterbury, presided over the ceremony. The chronicler Walter Bower described Ermengarde as ‘an extraordinary woman, gifted with a charming and witty eloquence’. William was to be faithful to Ermengarde even though he had mistresses before he was married. They had four children who survived childhood and lived for many years. Margaret of Scotland was born in 1193, Isabella of Scotland was born in 1195, Alexander was born in 1198 and Marjorie was born in 1200. William was in many ways a strong king. When Henry II of England died, William ingratiated himself with Richard the Lionheart and managed to get the Treaty of Falaise nullified. William paid him 10,000 merks in return and Richard used the money to go on Crusade. By cultivating favor with Richard, William alienated Richard’s brother, later King John. John was aggressive in maintaining his dominance over Scotland. There were periods of fighting and negotiation which lasted from 1193 to 1209. William was to finally come to terms with John in August of 1209. The terms were one-sided and humiliating to William. King John seemed to covet the Scottish throne. There was a period of severe storms in Scotland in 1210. William was to become increasingly ill and aging. Others began to fight for his throne. He wanted to secure the succession for his young son Alexander. He travelled south to England with his family to negotiate with King John in 1212. Probably due to her husband’s incapacity, Queen Ermengarde is credited with mediating a renegotiation of the 1209 treaty. Prince Alexander’s succession was secured. King John was to choose Alexander’s bride; presumably his own daughter Joanna and Alexander was knighted at Westminster. Entering his seventieth year and ill, William increasingly relied on Ermengarde to take over some of his duties. There is evidence Ermengarde wielded considerable influence in public affairs. There is a record of her presiding with the Bishop of St. Andrews over a complex court case. There was a complaint by a canon that a royal chaplain obtained the bishopric of Glasgow by bribing the King and the Queen in 1207. Her relatives benefited from her status as Queen. Prince Alexander also began taking on some duties in training and preparation of becoming King. William lingered on through 1213 and 1214. He recovered and was well enough to travel north to Elgin in 1214. But the traveling caused a collapse and he was slowly brought back to Stirling. He finally died, surrounded by his family on December 4. Ermengarde was distraught and lethargic over her husband’s death. The next day Alexander was crowned at Scone. The male primogeniture succession was a recent invention and there were other claimants to the throne so the crowning was made before the old king had even been buried. Five days later, the funeral cortege made its way to the abbey at Arbroath, escorted by Queen Ermengarde and William was buried. Ermengarde was to live another twenty years. She devoted her time to her cherished project, a Cistercian abbey at Balmerino in Fife. She raised money, purchased the land and oversaw construction of the building. Monks came from Melrose to found the colony in 1229 and Ermengarde and Alexander stayed at the abbey many times. When Ermengarde died on February 11, 1233, she was buried before the high altar in Balmerino. It’s a shame we don’t have more historical record about this capable and significant woman.